Two weeks ago, Japan commissioned its largest naval vessel since the end of World War II. Sleek and with the clean lines of a ship designed for stealth, JS Izumo pulled into Yokosuka Naval Base, her new home port, and officially joined the Maritime Self Defense Force. Izumo is a sign of the times, a weapons system that pushes the boundaries of Japan's war-adverse culture and increasing tensions with China. Officially, she's a "helicopter destroyer" — a destroyer designed to carry helicopters. But Izumo is no ordinary destroyer. Destroyers are not 800 feet long nor do they displace 24,000 tons. They also don't have a flight deck that runs the entire length of the ship, aircraft hangars, and the capability to embark up to 14 helicopters. 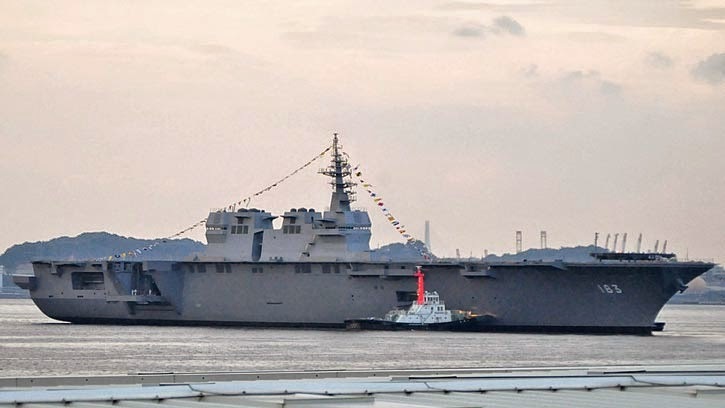 Izumo is what most countries — particularly China — would call an aircraft carrier. Japan at the start of World War II had the greatest aircraft carrier force in the world. A fleet of six carriers attacked the U.S. Pacific Fleet at Pearl Harbor, altering the balance of power and convincing the world that the days of the battleship were over. By the end of the war most of Japan's carriers were at the bottom of the ocean, and the Asian nation vowed never to produce offensive weapons ever again, aircraft carriers in particular. Japan says Izumo's mission is to hunt submarines and mines with helicopters, which are able to search the ocean faster and more safely than ships. Izumo also has a disaster relief mission: In the aftermath of the March 2011 earthquake, American aircraft carriers were invaluable, providing a floating helicopter base when those on the ground had been destroyed by the earthquake and tsunami. What alarms some of Japan's neighbors — China in particular — is that the ships are also capable of carrying the American Joint Strike Fighter. The F-35B, designed to take off and land vertically for the U.S. Marine Corps, is an ideal fit for the Izumo class. Izumos could likely embark up to eight or nine of the stealthy, fifth generation strike fighters. For decades, Japan has explicitly banned possession of aircraft carriers and marine infantry as tools of expeditionary, aggressive warfare. Izumo's stated role — and a second ship of the class will enter service in 2017 — is in line with Japan's vow not to make war on other countries but still preserve the capability for self-defense. Now however, with China laying claim to the Japanese-held Senkaku Islands, and even inhabited islands such as Okinawa, Japan is raising a unit of marines with the idea that they are "defensive" and would be used to garrison — or liberate — territory from an enemy. The same justification could be used for an aircraft carrier. Japanese fighter planes scrambled 400 times in just one year to intercept Chinese planes nearing their territory. Japan has a limited number of air bases capable of supporting the Senkaku Islands, so a floating one would actually be pretty useful. Modifying the Izumo to make it a true aircraft carrier is a decision that won't be taken lightly. It will be expensive: In addition to the cost of procuring up to a dozen fighters (the per-unit price of an F-35B is currently a whopping $116 million), her flight deck will need to be strengthened to cope with the massive amounts of heat the F-35B generates during takeoffs and landings. The cost could end up being near two billion dollars — as much as the ship itself. Despite being the third largest economy, Japan doesn't have a lot of money to spend on defense. She is also deeply in debt, with a public debt approaching 230 percent of GDP. Any steps to match China's growing military power must be carefully considered. In the end, the deciding factor which way the Izumo class goes will be China. If China continues to test Japan's airspace by flying fighters nearby, increases its holdings of modern, fifth generation fighters like the J-20 and J-31, then it will give the Japanese government all the justification it needs. If not, converting Izumo and her yet-unnamed sister ship to full-fledged carriers will be a tough sell, particularly to the Japanese public. Time will tell what direction Japan ultimately takes. If, 10 years from now, Izumo only has helicopters on her flight deck, the situation in East Asia will be relatively peaceful and optimistic. But if there are fighter planes on her deck, relations between Japan and China will have taken a darker — and more dangerous turn.